Waterborne nanomolar technology product. Exceptional for the waterproofing of mineral substrates on vertical and horizontal surfaces, both indoors and out. 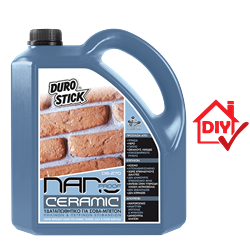 It is recommended for application on porous substrates such as clay roofing tiles, absorbent tiles, cotto, concrete, plaster, drywall, natural stone, clay, and ceramics. It penetrates deeply through the pores of surfaces and vests them with hydrophobic properties without blocking their breathability. It prevents the appearance of hairline cracks; it does not favour the growth of fungi and mold, and the creation of salt stains. Odorless, water based, and friendly to human and the environment. 1lt/8-11m², depending on the absorbency of the surface.